When we got our first look at the Amazon Echo Spot in September 2017, we were intrigued and inspired by how attractive it was. Before the Spot came along, Amazon’s Echo devices weren’t much to look at. The original Echo was a large cylinder that resembled some sort of mechanical pillar. The Echo Show – Amazon’s first device with a screen – was also blocky, and resembled a small TV. The all-new Echo, released earlier this year, was smaller and cuter, but still retained its cylinder-like shape, and left us hoping for more in the looks department. The Spot, available for $130, is different. It’s a beautiful, rounded piece of hardware that is somehow sleek, cute, and fun at the same time. It’s Amazon’s best-looking Echo device to date. We got our hands on the device to test the functionality, and found ourselves glancing over at the device not just to catch the time, but admire its beauty as well. But how does it perform as an Echo device? 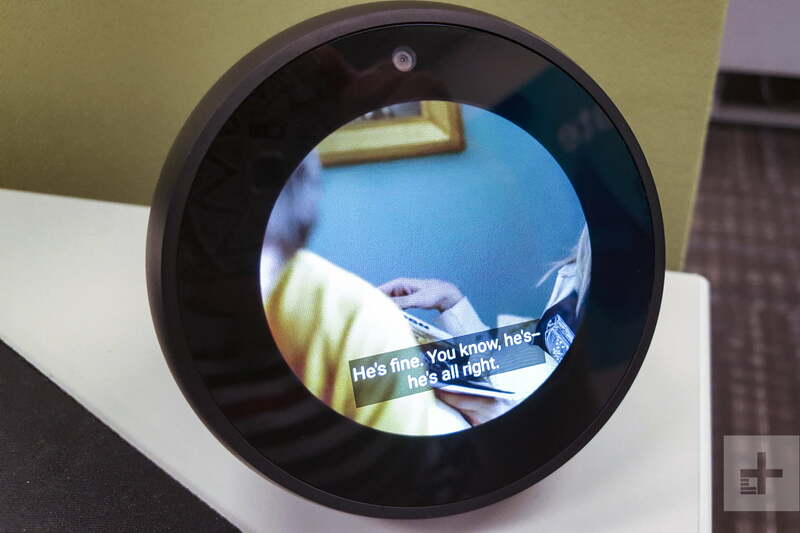 The Echo Spot – available in white or black – is about four inches by four inches in size and has a 2.5-inch screen. It weighs 14.8 ounces, and looks a bit like a high-tech softball cut in half. It does all the things the other Echoes do — control your smart home devices, make calls, and tell you who the 12th president of the United States is (answer: Zachary Taylor). The Spot rests on its flat bottom with the screen at a slight upward angle – a perfect little alarm clock, if that’s what you choose to use it for. On the top is a mic on/off button, a volume up button, and a volume down button. On the back is the power connector and an audio jack. The Spot’s exterior appears to be a smooth texture like the original Echo, which we noted had a fingerprint problem. We found that smudges easily wipe off the Spot, though. Amazon created a beautiful, rounded piece of hardware that is somehow sleek, cute, and fun at the same time. To use it, just plug it in. After a short boot time, Alexa says the device is ready for setup. If you haven’t already downloaded the Amazon Alexa app, you’ll need to. If you already have an Alexa App, connecting your device to it is extremely easy – just open the app, sign in to your Amazon account, and the device will automatically sync. When you turn on the device, you’ll have to manually turn on the microphone by pushing the button on top. The display screen is clear, and the default screen is an analog clock. Like the Echo Show, you can use your finger to pull down a menu from the top of the screen. From there you can adjust brightness, turn on do not disturb, or access the settings menu. The settings menu features some fun stuff to customize. In addition to turning on Wi-Fi and Bluetooth, you can choose what kind of theme you want to set on the display, whether you want to look at your clock in digital or analog format, and how loud and bright you want the device to be. You can also create a slideshow of personal photos to set on the home screen and change the sounds you hear. 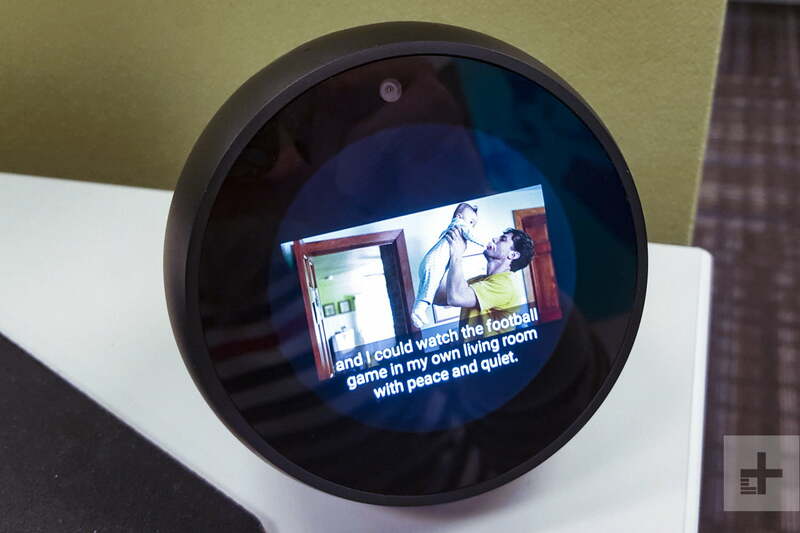 And that’s just the beginning — the Echo Spot has many tricks. One difference from the Show – other than the size – is that the Spot gives you additional customizable options with the clock. You can choose from different themes and home card preferences, where you can auto dim the clock at night and customize the times of day that you want this to happen. Overall, the interface is extremely user-friendly and intuitive. The options on the Spot are laid out in easy-to-use drop-down menus and submenus. The difference between the Spot and other smart speakers on the market, like Google Home, is the screen. While the Spot’s screen is tiny, it’s still a great feature. If you like to both listen and view recipe instructions in the kitchen, for example, the screen is handy. Flash briefings for both the Show and the Spot are delivered through a combination of Alexa reading text, and a Reuters video featuring the news of the day (the Alexa app lets you customize your briefing). Depending on which Alexa skills you add to your device, you can watch recipe videos, local news broadcasts, or even TV shows. Don’t count on being able to watch YouTube videos, though, until the feud between Google and Amazon is worked out. Like all Echo devices, you can sync various streaming music and video services with Alexa. Be warned, though, that while the Spot’s screen is clear, it’s also tiny. Watching Manchester by the Sea was like viewing on a large smart watch. We don’t envision that many will be interested in using the Spot for movie-watching. As for sound, the Spot has a bigger speaker (1.4 inches) than the Echo Dot (.6 inches) and there’s definitely a richer sound that comes through the Spot when compared to its older sister. Still, don’t expect great audio like you might with the Sonos One Alexa-enabled speaker. The device also features a 3.5 mm stereo audio output to use with external speakers if you need more bass. Like other Echo devices, the Spot lets you make calls through Alexa. Once you set up Alexa to recognize your voice, she can access your contacts and make a call. So, when you say, “Alexa, call Juliana,” she’ll answer by clarifying who she’s talking to, as well as the contact. We tested out this feature, and once connected, we could hear Juliana clearly through the Spot. Juliana said she could hear us clearly as well, though the quality was like a speaker phone. This is an improvement over the Google Home Mini, which was tinny and difficult to hear. We envisioned using the calling feature while getting ready for work or cooking dinner, and it’s nice to know that clear sound is there even from across the room. We’re a little uncomfortable with the idea of having a device with a camera facing our bed. 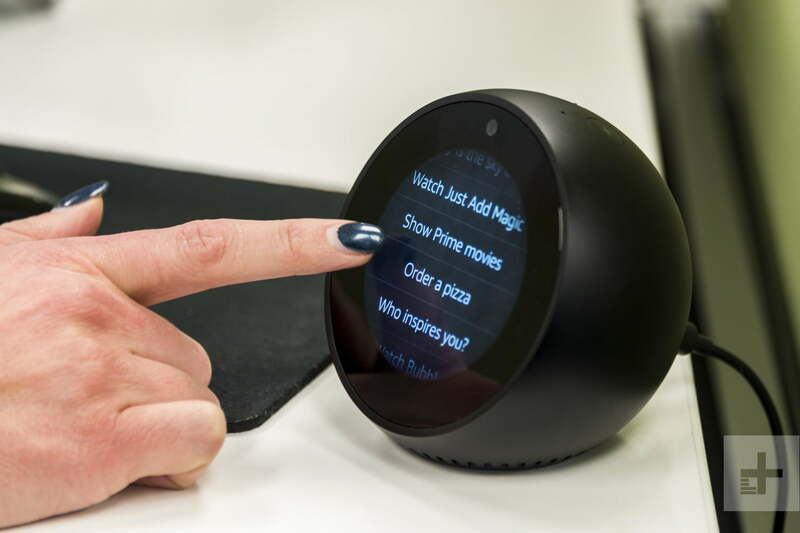 The drop-in feature allows you to use your Echo Spot as a visual intercom of sorts, meaning that you can video call other Echo devices in your home with a screen, or others outside your home, depending on your settings. We were able to use the feature for a video chat from the Spot in our office to an Echo Show in one of our test homes. The video was a lot like Skype or Google Talk. The quality of video on the Spot was clear, but the person using the Show said we looked rather grainy. A note about the drop-in feature – if you have it and the camera enabled, and someone is trying to reach you, you don’t have to be present to “answer.” This means someone can use the feature to activate a live camera in your home. You’ll want to make sure the drop-in feature is set only for those close to you, or if you’re concerned about your privacy, turn off the drop-in feature entirely. We do have a few small gripes about the Spot as an alarm clock. First, we’re uncomfortable with having a device with a camera facing our bed. You can turn the camera and the drop-in feature off in the settings menu, but the camera is still there. The idea makes us uneasy, considering Google’s issue with the Home Mini recording everything and ongoing problems with security with Internet of Things devices. Our second gripe? We wish it had a USB port for charging a phone. Lastly, $130 is a bit steep to pay for a fancy alarm clock. Still, being able to ask Alexa how long our morning commute will take while we lay in bed means we may be able to say “Alexa, snooze the alarm,” one more time. The Echo Spot has a one year parts and service warranty. With its sleek design and the additional alarm clock features, the Echo Spot is an attractive device that could be useful in any room. With its small alarm-clock-like screen with built in smart assistant Alexa, this is the first device of its kind. If you’re in the market for a smart speaker and don’t need a screen, consider the Echo, Echo Dot, or Google Home Mini. If you’re seeking a smart speaker with a larger screen, consider the Echo Show. With Amazon now featuring a handful of Echo devices, and with companies scrambling to add Alexa skills and capabilities, the popular smart speakers are here to stay. Amazon issues firmware updates often to fix glitches, and the company has a reputation for great customer service. If you’re in the market for a smart speaker that doubles as a cute little screen and an alarm clock, buy the Spot.